Of course, they don’t have hands. But scientists used motion-sensing tags to show that most blue whales roll to the right as they feed – except when swimming upward. 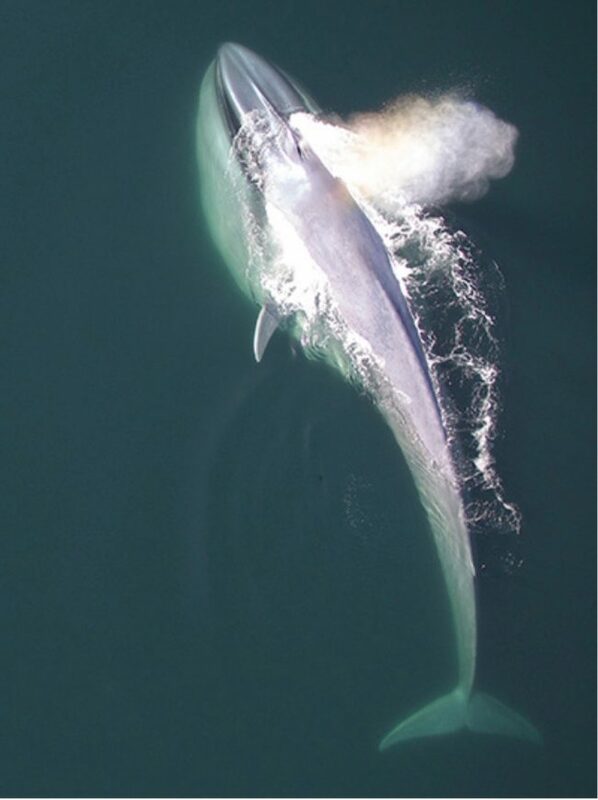 This aerial photo shows a blue whale lunge as it feeds near the ocean surface. New research shows blue whales show a right-side preference for rolling behavior during feeding, but they roll to the left side for more acrobatic feeding behaviors. 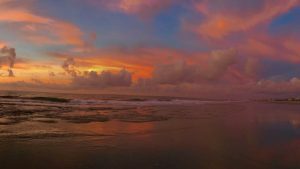 Photograph courtesy of John Durban (NOAA) and Michael Moore (WHOI)/ via UC Santa Cruz. A wonderful recent study describes the intricacies of the feeding behavior of the blue whale, the largest animal on Earth, perhaps the largest animal ever to have lived on Earth. While feeding, a blue whale accelerates underwater and opens its mouth to take in great quantities of seawater. 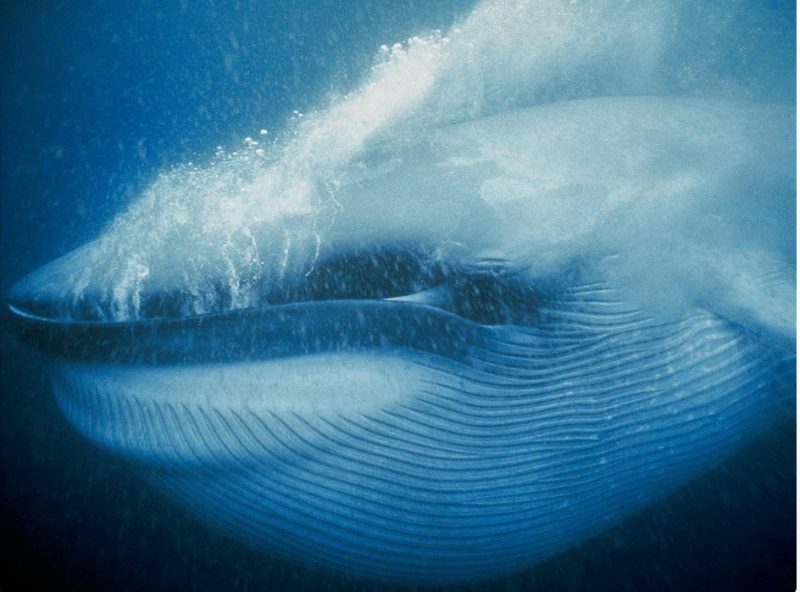 The mighty whale then traps its prey – tiny creatures called krill – by forcing the water through sieve-like plates in its mouth, called baleen plates. All of this is known, but what wasn’t known was that most blue whales appear to have a right-side lateralization bias – that is, they roll to the right most often – as they feed. That’s the case except, as it turns out, when they swim upward from the ocean depths. Cetacean expert Ari Friedlaender of the Marine Mammal Institute at Oregon State University and UC Santa Cruz led the study. It was published November 20, 2017 in the peer-reviewed journal Current Biology. Most of the movements we tracked that involved ‘handedness’ – perhaps as much as 90 percent – involved 90-degree side rolls, which is how they feed most of the time. Blue whales approach a patch of krill and turn on their sides. We found many of them exclusively rolled to their right, fewer rolled just to their left, and the rest exhibited a combination. In vertebrates, the left hemisphere of the brain controls coordination, predictive motor control and the ability to plan and coordinate actions – like feeding. And the left side of the brain is linked with the right eye. Blue whale feeding on krill. Image via Monterey Bay Aquarium. 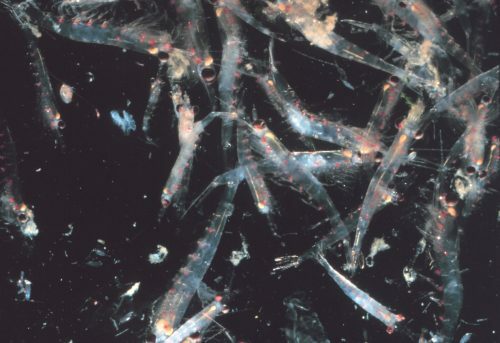 A swarm of krill, via NOAA/ Wikimedia Commons. The patches of prey near the surface, between 10 and 100 feet deep, are usually smaller and less dense than prey patches found deeper and the blue whales showed a bias toward rolling left – presumably so they can keep their right eye on the prey patch and maximize their effort. These are the largest animals on the planet and feeding is an extraordinarily costly behavior that takes time, so being able to maximize the benefit of each feeding opportunity is critical. And we believe this left-sided rotation is a mechanism to help achieve that. And, in case you’re wondering, the video below shows what it’s like to tag a whale! Bottom line: A team of scientists has used motion-sensing tags to show that most blue whales do have a right-side lateralization bias – except when they swim upward. Via Oregon State University and UC Santa Cruz.